Want to know the shortcut in this delectable dessert recipe? 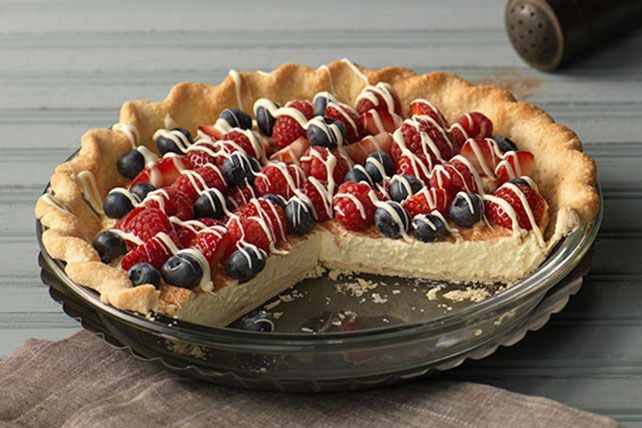 We used a ready-to-use refrigerated pie crust in this Rustic Berry-Cream Tart to cut down of prep! Prepare and bake pie crust in 9-inch pie plate as directed on package for one-crust baked shell. Cool completely. Beat pudding mix and milk in medium bowl with whisk 2 min. Stir in Cool Whip. Spoon into crust; sprinkle with cinnamon sugar. Top with berries; drizzle with melted chocolate. This colourful tart can be refrigerated up to 6 hours before serving. Or for longer storage, store crust (in airtight container at room temperature) and filling (in refrigerator) up to 24 hours. Spoon filling into crust, then top with berries and melted chocolate just before serving.